Unite became aware of the problem over a year ago but usually challenges to the dismissals were dealt with through confidential settlements so we couldn’t expose the issue publicly. We tried to tell the company that what it was doing was illegal and a potential PR disaster. In August we became aware that the dismissals were continuing so decided to raise the issue publicly. Doing yet more “confidential” settlements was not a solution. The company needed a wake up call. We also approached the Human Rights Commission but I was shocked to discover that they can’t investigate or prosecute companies for institutional failure. They only deal with individuals and again, usually, confidential settlements are reached at mediation. But a bit of media attention (see below) was enough for KFC to get dozens of angry messages on its facebook page. Senior management minds at Restaurant Brands got focussed and agreed that something had gone wrong. There is a lesson here. Unions are about solidarity. That means in particular solidarity and support for the most vulnerable. In this case these workers were the most vulnerable of the vulnerable. They often couldn’t even speak for themselves. They needed advocates. Often these advocates did a heroic job to try and get the company to reverse course. But treating each situation as an individual “problem” to be solved is not a way forward when we have a case of institutional failure. That’s where the union is able to do more than individual advocacy. That is also what unionism should be about. Tanya van Lunenburg is expected to be offered her old job back at KFC in Birkenhead. Disabled workers who were axed from their jobs at KFC are being offered their positions back with the company. Herald on Sunday revelations of store restructures that forced out staff with disabilities outraged customers in New Zealand and overseas, with many people taking to the fast-food giant’s Facebook page with calls for a boycott. The story was shared 54,000 times on Facebook and more than 200 times on Twitter. KFC also came under pressure from the Unite Union, Labour MP Jacinda Ardern and Green MP Mojo Mathers who said cutting limited-duties roles deliberately targeted workers with disabilities. This week, the company relented. "We’re really pleased we’ve been able to reach an agreement with Unite Union to reinstate these roles," said Restaurant Brands chief executive Russel Creedy. "We understand how important these roles are for disabled staff, their families and caregivers." Unite’s Mike Treen said the company had agreed to contact each of the 17 affected workers to offer them re-employment with appropriate training. Even workers who left with confidential settlements would be "welcomed back", according to KFC general manager Brent Kitto. Kitto said a company review was already under way. "We won’t just sweep this under the carpet. It looks like we’re heartless and it’s not the case at all," Kitto said. "I’m still trying to work out how it got to where it did. I’m just ecstatic we’ve got a really good resolution." Meetings have been arranged with some of the axed workers. "Hopefully we will have meaningful jobs for these guys and welcome them back into the team at KFC," said Kitto. Mojo Mathers said she was delighted. "KFC has listened to public opinion," she said. "I hope that KFC rethinking their position will inspire other employers to look at the ways they can make their workplaces and employment policies inclusive of workers with disabilities." Jacinda Ardern is pleased the company has done the "right thing". "It shows the power of people sharing their views and making them known. Organisations like this can’t afford to ignore them anymore." Tanya van Lunenburg has had a great week, and things ought to get even better. The 48-year-old, who has an intellectual disability, is among the disabled KFC workers with "limited duties" roles who were laid off by the company. They are now being approached with offers of re-employment. Tanya lost her position packing the potato and gravy at the KFC in Auckland’s Birkenhead last year after 18 years on the job. Her father Bob, 83, said he was overjoyed when KFC contacted him this week with a request to meet on Monday: "It was altogether too much to believe." But he hasn’t had the heart to tell his daughter in fear of getting her hopes up. "I’m cautiously optimistic and that’s hard to explain to Tanya," he said. "I didn’t dare tell her because she will be totally overcome to get back on the bus to work and join her old workmates," he said. On Friday, Tania revisted her old workplace. "She had a chat to her old manager and got hugs from her former colleagues." Work for the mentally disabled used to be provided in so called sheltered work- shops. These days, it depends on employers with a sense of social responsibility. They can give disabled people the dignity of a real job and semblance of personal independence. One of those employers has been the fast-food chain, KFC New Zealand. Its staff included disabled people who could do basic tasks such as filling its side-order packs and cleaning. Last year it had a change of heart. Its owner, Restaurant Brands, decided to review its costs and find ways to maximise the chain’s profitability. One way was to require all staff to be capable of doing any job in the store, from the counter to the kitchen. Soon, the disabled were getting notice. Today, it is a pleasure to report jobs for all abilities are being restored. Restaurant Brands has announced an agreement with the Unite Union to re-instate "limited duties roles". Chief executive Russel Cready says, "We understand how important these roles are for disabled staff, their families and caregivers." What the company really understands is how much damage last year’s decision was doing to its business. 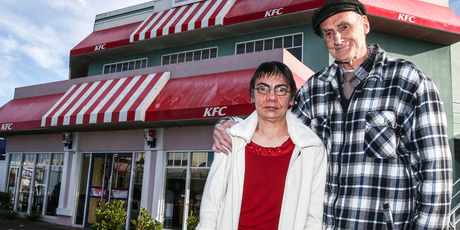 The Herald on Sunday revealed the systematic lay-offs of disabled workers at KFC. The anguish of these people and their families was heart-rending. One of them was a 48-year-old woman who had been packing potato and gravy at a KFC outlet for nearly 18 years. She loved putting on her uniform and going proudly to work, her sister said. Then she was handed a notice that indicated her job had been abolished because she could not take a turn at the front counter. Cases such as that caused KFC customers to express their disgust on the company’s Facebook page, some resolving never to set foot in a KFC outlet again and calling on others to boycott the brand. Wisely, the company had second thoughts this week, agreeing to re-employ the 17 affected people in limited duties roles and provide training in health and safety practices so that they can work unsupervised. For those unable to work unsupervised, it will consider having a caregiver on site. If KFC proves to be as good as its word, it will deserve praise as loud as the protest it has received. We the public do not give socially responsible employers enough recognition when they deserve it. Employment is a heavy responsibility and a major cost of any business. Those that make room for disabled people, even at minimum wages, may sometimes be compromising their efficiency and profitability to a degree. They do not advertise their gesture and do not expect customers to reward them for it. But we should. Next time we encounter someone with a disability working in the likes of a supermarket or a service station, we should make a note to ourselves to visit more often. The pride these people take in their jobs and the care they bring to them is as great, or indeed greater, than many other workers who may be more complacent about their employment. The closing of institutions and the inclusion of disabled people in everyday life and jobs has been one of the great social advances of recent times. Employers who take the trouble to make a little room for them are acting with quiet humanity. KFC was one of them and if it acts as it now says, it will deserve that credit again. 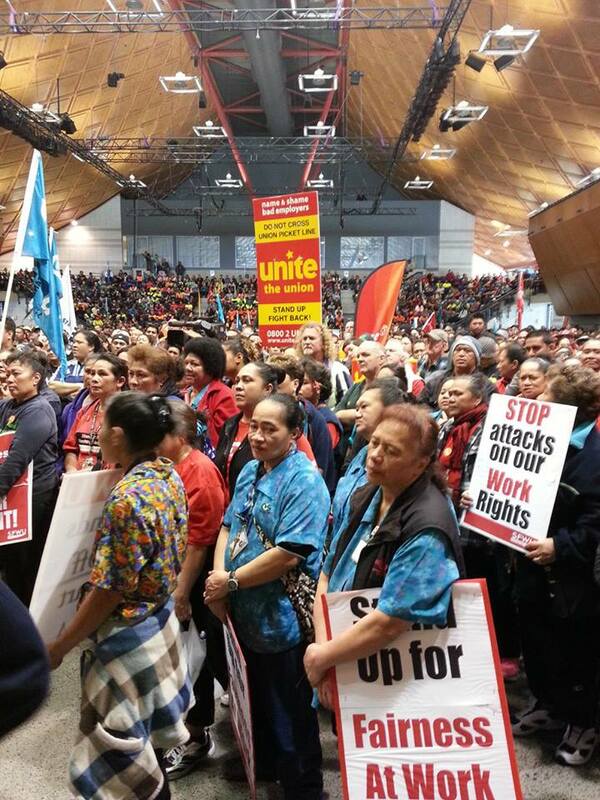 Unite will be holding its national conference and AGM in Auckland on Tuesday 26th and Wednesday 27th of November at the Mecure Auckland, 8 Customs Street, Auckland (note that the venue has changed from the initial notice). Delegates will be attending from all over the country to participate in training workshops, discussions about the future of unionism and Unite, and to elect Unite’s National Executive, the leading body of the union. The conference is a great opportunity for leading members from different sectors and regions to meet up, learn from each other’s experiences, and take the movement forward. Any member can attend as an observer but voting representatives need to be either elected as AGM reps or already elected as union reps on their worksites. After five dark years, the Labour Party have their mojo back. The past month of quality presentations by David Cunliffe, Grant Robertson and Shane Jones was a great success. Day after day the media covered confident and articulate candidates espousing policies the faithful wanted to hear. The Prime Minister was pushed to the sidelines for the first time. Luckily for the sake of party unity, Cunliffe’s win was decisive. The overwhelming members’ vote and the even higher support by the unions is a huge mandate. 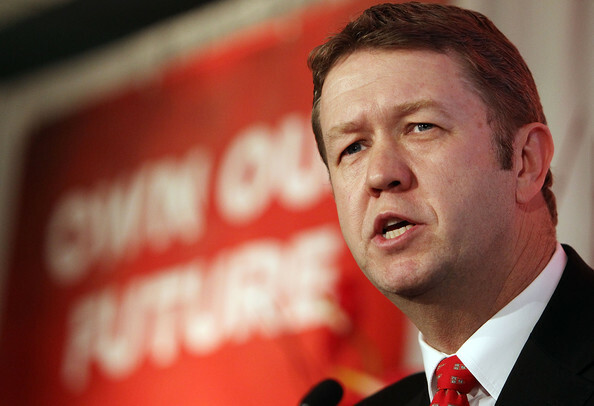 Even in the caucus, Cunliffe surprisingly got 16 MPs to Robertson’s 18 – a difference of one MP. The mana of Robertson and Jones has increased, too. Robertson will be leader one day and Jones has cemented himself back as a future contender. It was always unrealistic to have any of the three being a loyal deputy to the other. David Parker was a good compromise. He’s the brains and the policy wonk. Competing with the Greens for the same vote is a zero game. Cunliffe is smart and knows it’s the 800,000 voters who didn’t bother to turn out at the last election he has to win over to be Prime Minister. Some pundits pose that Cunliffe has to move to the centre. That’s silly. The centre doesn’t exist. Parties win by convincing the majority of their policies – whether left or right. If the electorate supports left policies, by definition the centre moves leftwards. If it supports right policies, the centre moves in the other direction. The centre is never some fixed point. Cunliffe’s policies of forcing up wages, opposing asset sales, investing in public services and spreading the tax base are unabashed left policies. What matters is that they are popular and could potentially motivate hundreds of thousands of non-voters to turn out. To do that, the parties of the centre-left have to build a machine to get the Auckland vote out. They were creamed in our biggest city in the past two elections. Who wins Auckland, wins government. With this new momentum for the left, I hope they can capitalise on next month’s local elections. Postal ballots for local government across the country are hitting mailboxes this weekend. In Auckland, there are hundreds of candidates contesting more than 200 positions. Len Brown will romp home, of course. The only interest is how many votes John Minto gets on his left and John Palino on the right. The real contest is for the council. Currently it’s a third on the right; a third on the left, and a third in the centre. Most voters don’t have any idea where many candidates’ political allegiances lie. The Auckland trade unions have 150,000 members. They have assessed all the candidates against the three campaigns they are running: Protecting the Assets – no privatisation; A Living Wage – starting with council workers; and Sorting out the Port – force the incompetent ports bosses to settle a fair deal with their workers. Most candidates support the unions’ campaigns but the unions don’t want to split the centre-left vote. Most unions are non-partisan. For the first time, the Auckland unions steering group, of which I am a member, is recommending a single candidate it believes has the best chance of winning, for each elected position. You can peek on www.UnionsAuckland.com. Union members of course will vote for whoever they like. But for those who want to use their vote strategically the recommendations could be decisive. Wards have an average of 10,000 union members. Draw your own conclusions. It’s good to see the Labour Party getting its act together. Hopefully, workers will unite to win too. Unite spokesman Mike Treen said he was outraged to learn that "confidential" settlements were being negotiated with more disabled workers. "KFC is trying to cover up their mistaken policy rather than deal with it openly," he said, adding that he knew of 10 workers affected but suspected the number was far higher. Labour MP Jacinda Ardern has written to the Human Rights Commission calling for an investigation following Herald on Sunday revelations this month. "The company’s ‘catch-all policy’ is unfair and unjust. If it were applied to any other workplace we would find many employees would not meet such a test." Green Party disability issues spokeswoman, Mojo Mathers, said Restaurant Brands’ policy was discriminatory. "They exclude from employment many disabled people who may have a lot to contribute to the workforce but cannot tick all the boxes for the skills. I will be pursuing it." Restaurant Brands chief executive Russel Creedy said the company had offered support for those who needed to be moved into other jobs or activities. "We have not made changes to our employment policy but disestablished limited duties roles." Bob Van Lunenburg broke into tears when KFC put off his intellectually-disabled daughter after nearly 18 years on the job. Van Lunenburg, 83, says Tanya was fired from KFC in Birkenhead where she’d worked two afternoons a week packing potato and gravy. "That was her whole life and it gave her something to look forward to," he said. A KFC outlet management told him Tanya, 48, could not help at the front counter and so her job had been discontinued. "I went outside and cried." He says a subsequent mediation meeting was unsuccessful. "I told them, how you could ever do that to a girl like Tanya is beyond all belief." Van Lunenburg had a sleepless night churning over what he "should have said". "I thought if only I’d said more, I might have been able to help her keep her job." Tanya’s sister Nikki says her sibling loved putting her uniform on and was proud of her job. "For her it was very significant." I have avoided doing a blog on the Labour Party leadership race because I’m not a member of the Labour Party and I don’t have much confidence that they would deliver on the promises made. In my view unionists and socialists should focus on building a social movement that can organise and mobilise working people in the hundreds of thousands. Relying on parliamentary representatives to do the job for us is a fundamental flaw. Even if Labour’s new leader David Cunliffe was a committed socialist he would be powerless to stand up against the pressure big business would bring to bear unless there was a massive movement below to give strength to those in government who wanted to push forward real reforms in the interests of working people. Big business launched a massive “winter of discontent” shortly after the election of the Helen Clark led Labour Alliance government in 1999. Following that display of strength the government reform programme came to a virtual halt. Similarly “closing the gaps” for Maori was shut down at the first hint of opposition and anything that smelt of affirmative action abandoned. I don’t believe David Cunliffe is a socialist. He is someone from the right of the party who has genuinely come to question the mantras of free-market capitalism and the inequality it produces. But that is not unusual today – even World Bank and IMF economists are claiming a new found belief in the importance of reducing inequality. Their solutions to the problem however remain firmly within the bounds of those acceptable to the maintenance of the system. And that is the nub of the problem. Big Business will only ever accept a programme of social reform that may benefit working people when they feel their system is under threat. That was true in the 1930 and 1940s. Millions of working people were mobilising internationally and usually under a socialist banner of some sort. The ruling classes got frightened and tolerated some reforms for a period. The great depression and war that followed also gave big business a profit boost that meant they could afford to pay a little more to keep the system safe. That is not true today. Even the relatively modest policies that David Cunliffe is talking about – a living wage, small tax increases for the rich and a capital gains tax – are likely to generate significant business opposition. The usual response from social democratic governments in those circumstances is capitulation. I expect no difference from a Cunliffe-led government. But I am also happy to be proved wrong. Unionists and socialists inside and outside the Labour Party actually have a common interest here. This includes people like myself who is a Mana supporter and many Green Party activists as well. 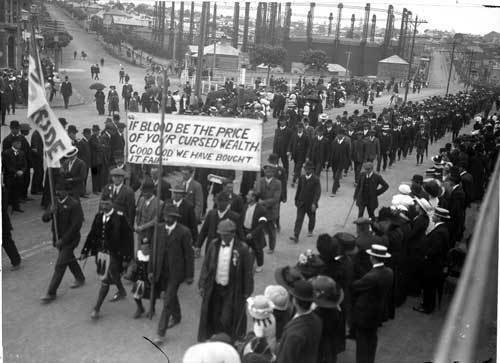 The only way there would be a hope for David Cunliffe and co to stand up against big business in government would be if we had had a massively organised and mobilised working class movement that had an interest in the promised reforms happening. This is where I think we need to look at what the priorities are that we want such a government to focus on. At the moment is seems to me that the CTU leaders are focussed on measures that can benefit workers generally outside of any organised framework. This is true for example of the living wage proposal or the idea of industry-wide national minimum standards being imposed by the government. I have no problems with the proposals as such – any increase in income or protections for workers is of course something to celebrate. However what we need above all is the ability to organise as a class and impose our own solutions to the problems that face us. Much more thought needs to go into what legal changes could be made that would give unions a greater ability to organise the 92% of the private sector workforce outside of unions. This includes access to the workplace and forcing employers to bargain for multi-employer collectives. We also need a significant extension of the right to strike to include those for political demands and for the enforcement of the existing contracts – rights eliminated by a previous Labour government. Income inequality is at crisis levels in New Zealand and could spiral out of control if it is not tackled soon, a visiting author says. 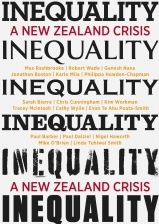 It is one of the messages in a recently published book, Inequality: A New Zealand Crisis, edited by Wellington journalist and author Max Rashbroke, who spoke at a panel discussion about the country’s widening income gap at Waikato University last night. Speaking before the event, Rashbroke said the idea of “a fair go” in New Zealand no longer existed. “I don’t think there is a fair go any more. Despite historically being one of the developed world’s most equal societies, that changed between the mid-1980s and mid-1990s, when income inequality accelerated, Rashbroke said. In 2010, New Zealand was ranked 20th among 34 OECD countries in terms of income inequality. “The reason we call it a crisis is because we’re at a point where we really need to tackle it,” he said. Drawing on comprehensive research and pulling together contributions from across professional fields, the book investigates the nature, causes and consequences of income inequality in New Zealand. It also provides some startling statistics. According to figures from the Ministry of Social Development for 2011, and quoted by Rashbroke, the average income of a single-person household in the middle band of income distribution was $30,800 in 2011, a figure that had risen less than 20 per cent from 1984, when it was $25,000. The book also outlines that anyone earning more than $72,000 is considered to be in the top 10 per cent of income earners in the country, while the top 1 per cent of the adult population own 16 per cent of the country’s total wealth. Meanwhile, half the population, including beneficiaries and pensioners, earn less than $24,000. Rashbroke said one of the biggest problems with entrenched inequality was the way it “makes a lie” of the idea that there were equal opportunities. “The evidence shows that in very unequal countries about half of your income, as an adult, can be predicted from what your parents earned. “When you’ve got really entrenched inequality, half of your success is based on how successful your parents are. Rashbroke said the first step to tackling income inequality was acknowledging and discussing the issue.